A still from the surviving "Marketplace" excerpt of the film. In 1932, Soviet animator Mikhail Tsekhanovsky began working on an animated film titled The Tale of the Priest and of His Workman Balda (Russian: Сказка о попе и работнике его Балде), that was an adaptation of Alexander Pushkin's fairy tale in verse of the same name. 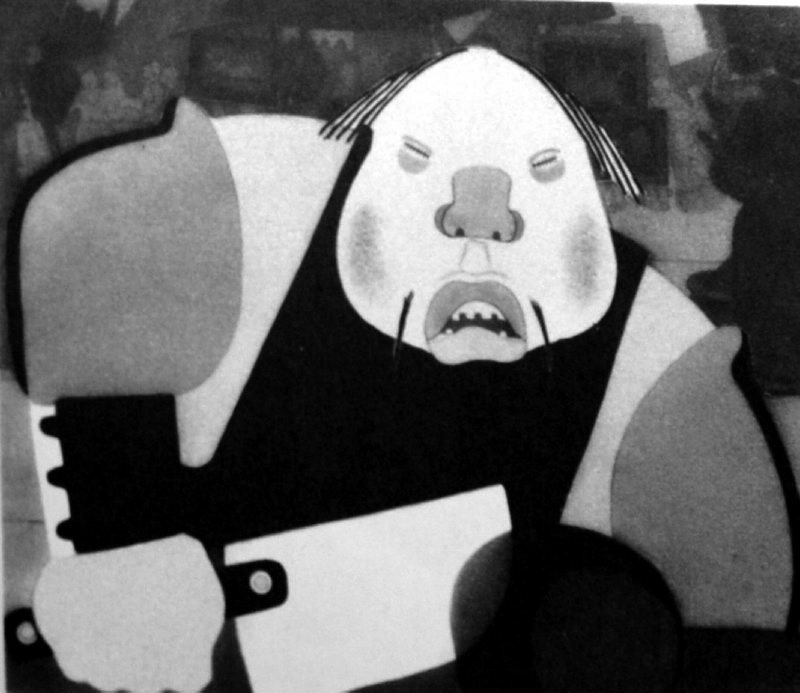 It would be Tsekhanovsky's first feature-length animated film. World-famous composer Dmitri Shostakovich was brought in to compose the film's score; in November 1934, he wrote that composing for the film was "easy and fun" and that the film contained a lot of "sharp, hyperbolic scenes" and "exaggerated characters". Aleksandr Vvedenskiy, a futurist poet and member of OBERIU society of poets, wrote the lyrics for Shostakovich's music. Unfortunately, Shostakovich had to stop working on the film due to a wave of criticism that hit him beginning in 1936 with Pravda article Muddle instead of Music. Problems also arose within the production of the film itself, alongside criticism of the film's constructivist art style deemed unfit for Pushkin's tale by critics. Eventually, the animation had almost reached completion by the end of the 1930s, when it was moved to Lenfilm archives. Due to bombings of Leningrad by the Luftwaffe in World War II, most of the film was destroyed in a fire in 1941. The sole surviving footage of The Tale... is a 6-minute excerpt known as Bazar ("Marketplace"). As suggested by the title, it takes place in a marketplace and features people trying to sell various goods. The lyrics were written by Aleksandr Vvedensky and titled Noisy Marketplace in his writings. The film's score, which was left incomplete by Shostakovich, was finished by Shostakovich's student Vadim Bibergan using various copies and drafts and published in 2005 in DSCH Publishers' New Collected Works of Dmitri Shostakovich.